Before we start, please note that all the examples in this instalment are contained in the file pbs64a.html in the instalment’s ZIP. If you open that file in a browser window you can see what each of the forms looks like at different breakpoints. When you have small forms that need very little information from the user it often makes sense to collapse the entire form into a single line. This is what inline forms were designed to facilitate. 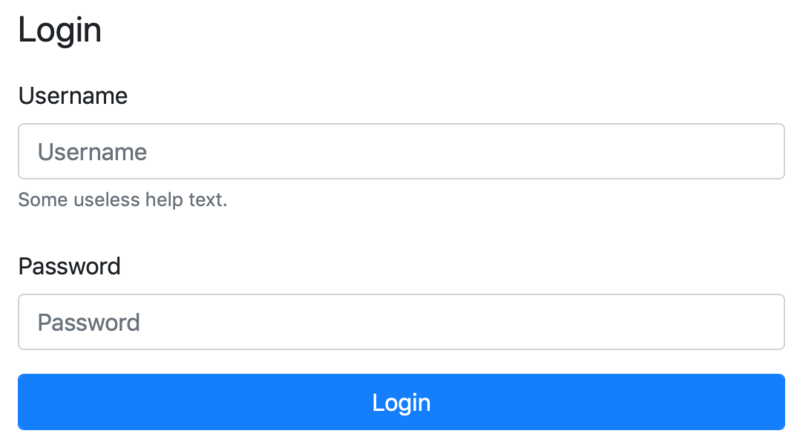 A classic example might be a login form which needs only two text boxes and a button. Bootstrap implements inline forms using flexbox, so you can use any of the flexbox-related utility classes with inline form element. You can also use Bootstrap’s sizing utility classes as needed. Bootstrap’s documentation is also very clear that while you generally don’t want to show labels within inline forms, you really should add them to support accessibility tools, so the recommendation to use sr-only utility class to hide them. One final point to note is that inline forms become regular forms at the smallest breakpoint and below. This makes sense because on tiny screens there just isn’t any room to inline even two form elements. When creating inline forms the markup is simpler than when creating regular forms. You wrap the inline form within an element that has the class form-inline, then you just add the form elements and labels directly within that container, giving each form element the class form-control as normal. The element you give the class form-inline to becomes a flex container, and each element within it a flex item. 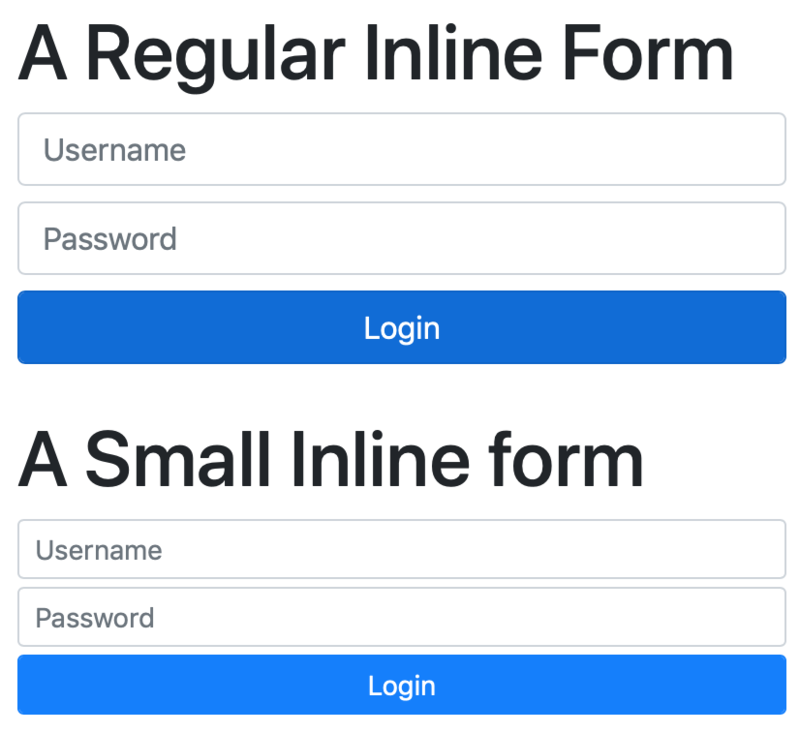 You don’t use form-groups within inline forms. I want to draw your attention to a few key points in this code. Firstly, note the use of the sr-only utility class to hide the labels from everything but assistive devices. The second thing I want to draw your attention to is the use of the sizing utility classes mr-sm-2 and mb-2. The first adds a small right margin at all breakpoints above the very smallest. I.e., when ever the form is not stacked a small right margin is added to stop the elements touching off each other. The mb-2 ensures that when the form is stacked that there is vertical space between the elements. Removing these classes results in a very ugly form indeed! This seems like the opportune time to mention that form elements, like buttons, come in three sizes, small, regular, and large. To make a form element small add the class form-control-sm in addition to form-control. You can use the class form-control-lg to make form elements large. Note that these classes are designed to be used alongside small and large buttons (btn-sm and btn-lg). Note the change to smaller margins with the replacement of mr-sm-2 with mr-sm-1 and mb-2 with mb-1. 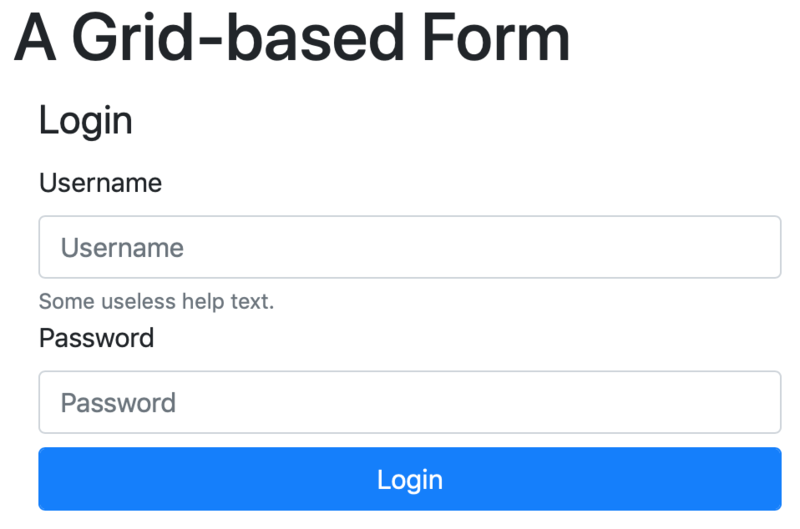 Another very popular alternative to the default vertically stacked forms are horizontal forms, where the labels appear to the left of the form elements. In structure horizontal forms are very similar to regular forms, you must use form groups (wrappers with the class form-group), but you treat those form groups as a special kind of row by adding the class form-row, and then divide the contents of those special rows into columns using the usual bootstrap grid classes. You should use the label as the first column within each row, and to get its vertical alignment correct, give it the additional class col-form-label. So, what you and up with is a wrapper with the classes form-group and form-row, containing a <label> with a col class (e.g. col-sm-3) and the class col-form-label. After the <label> you add one or more wrappers with a col class into which you add your form elements. Unlike inline forms, horizontal forms will not collapse down to stacked forms at small breakpoints automatically, if you want that behaviour you’ll need to make use of the usual grid classes and breakpoints to achieve it. I do want to draw your attention to one subtle detail in this form that makes use of a Bootstrap grid feature we’ve not seen before — the offset-sm-3 class on the <div> acting as a col for the button. This is an example of Bootstap’s offsetting classes, which you can read more about in the Bootstrap docs. What it means is that at breakpoints from small up the column for the button will be shifted to the right by three grid columns. 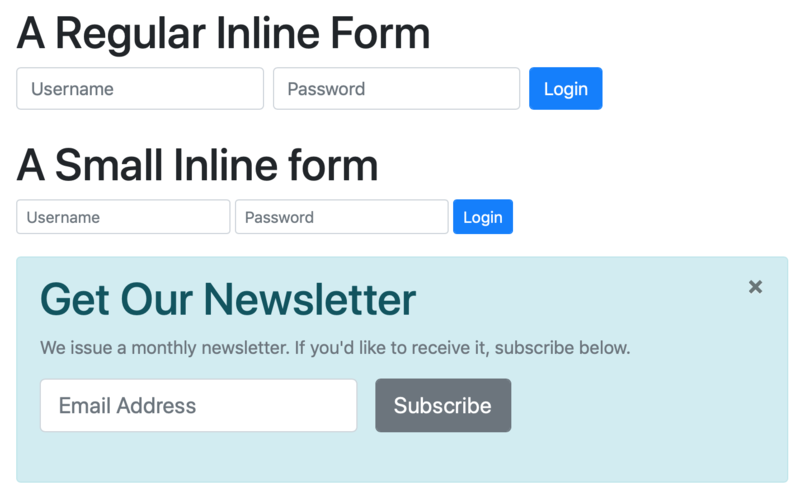 Finally, you can use a regular Bootstrap grid to lay our your form. The markup here is almost identical to a regular grid layout, but with the option to use narrower gutters between columns by replacing row with form-row. Rather than working with an empty page for this challenge, we’ll use the final version of the recipe we build as part of the earlier Bootstrap-related challenges. You can either use the final version of your own recipe as your starting point for this challenge, or the final version of mine, which I’ve included in the instalment’s ZIP. 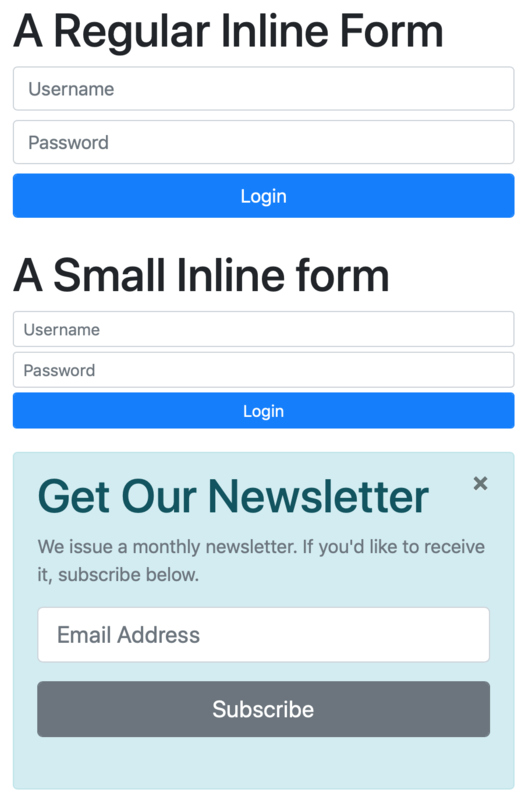 A footer containing a small inline form to allow an imaginary admin to log in. The form should provide a text box for the username, a password field, and a login button. When the user clicks the login button they should get a message letting them know that the form is just a dummy form, and that it’s impossible to actually log in. When the user submits the form it should let them know the form doesn’t actually do anything. When you’re finished, your entire recipe page, including these two new forms, should be well behaved, readable, and usable at all breakpoints. 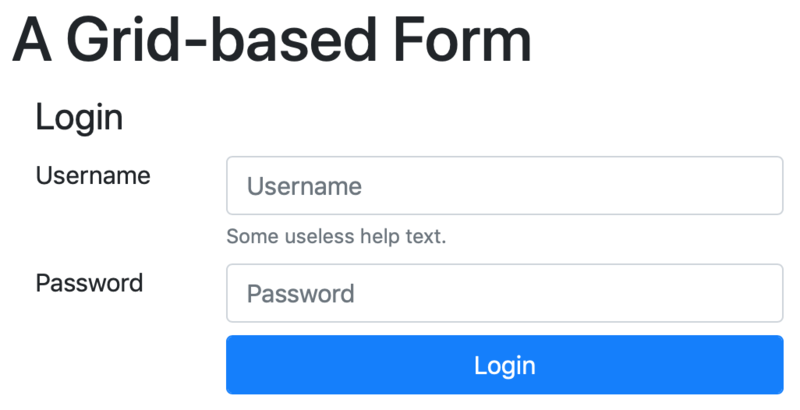 We’re nearing the end of our first look at forms in Bootstrap 4. This is by no means a comprehensive guide to every single form-related feature in Bootstrap, far from it, but we will have a nice overview by the time we’re done. To date we’ve learned how to take input from users, lay out our forms, and work with buttons. In the next instalment we’ll learn how to create richer inputs using Bootstrap’s Input Group component, and in the instalment after that we’ll round things out with an introduction to Bootstrap’s form validation features.